Emily Dickinson, one of the most important American poets of the nineteenth century, remains an intriguing and fascinating writer. 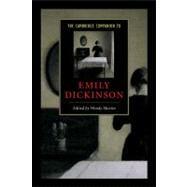 The Cambridge Companion to Emily Dickinson includes eleven new essays by accomplished Dickinson scholars. They cover Dickinson's biography, publication history, poetic themes and strategies, and her historical and cultural contexts. As a woman poet, Dickinson's literary persona has become incredibly resonant in the popular imagination. She has been portrayed as singular, enigmatic, and even eccentric. At the same time, Dickinson is widely acknowledged as one of the founders of American poetry, an innovative pre-modernist poet as well as a rebellious and courageous woman. This volume introduces new and practised readers to a variety of critical responses to Dickinson's poetry and life, and provides several valuable tools for students, including a chronology and suggestions for further reading.